I’m not saying that television is vulgar and dumb because the people who compose the Audience are vulgar and dumb. Television is the way it is simply because people tend to be extremely similar in their vulgar and prurient and dumb interests and wildly different in their refined and aesthetic and noble interests. It was a topic that came up over coffee at Ed and Laurie’s house Sunday morning; that all the things we do for entertainment are no more purposive nor less absurd than anything else we might do in any given moment in any given year. We being contemporary American humanity of a certain echelon, and yes I am including feeding ourselves (I have stood in line behind the choice-striken at Qdoba.). Our collective quest for entertainment is of course another word for fulfillment, or if you like happiness, and just as the DFW predicted over a decade ago, the sophistication of our quest and the range of options available has all too often subsumed the urge which moved the rock down the mountain in the first place. We spend so much time worrying about and looking for entertainment that we have forgotten what it feels like to be entertained. You are what your will eats. Ed, Laurie, Aaron, Norm. 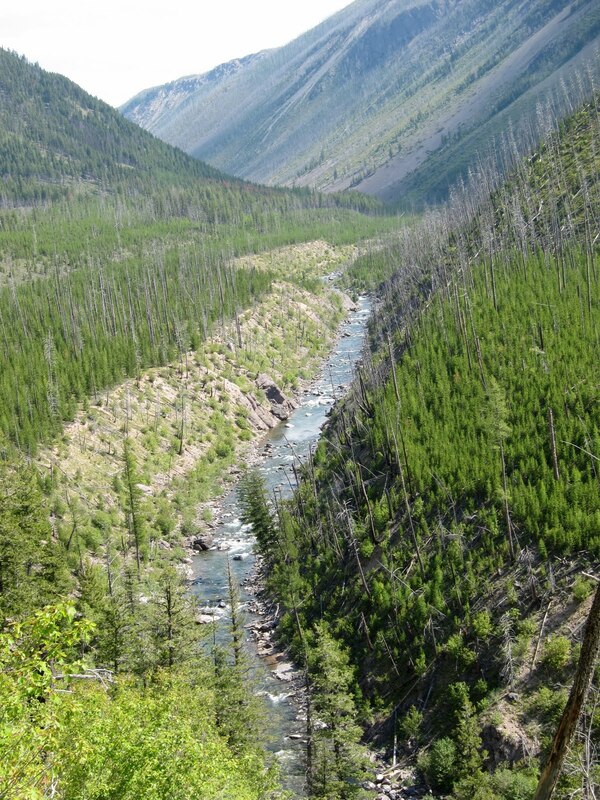 North Fork of Fish Creek, MT. Naturally, partway through last week (Tuesday around 11am) my thoughts turned towards the weekends entertainment. That is to say, I had a full schedule lined up for the work week already, had spent the previous weekend largely consumed with my non-serious job, and wanted to complete the range of things I find fulfilling by enjoying the perfect autumn weather outside, on an adventure. Aaron sent an email invitation for a big exploratory loop on the MT/ID border, which removed all indecision for Saturday. Proximity to the southern Bob and a record-high late season water table had me heading for the North Fork of the Blackfoot for packrafting and fishing Sunday, and the weekend was complete. The old-growth Red Cedar was extraordinary. We measured one trees circumference at around 260 inches. I took my time leaving home Friday evening, and got in to the trailhead well after dark. I set up camp under a vast, nuanced net of stars and slept well, waking up at daybreak covered with dew. I fortunately had a foresight to keep the stove and coffee within arms reach. The four from Missoula arrived presently, and we were on the trail by nine. Of all the human-powered, mechanized, gravity assisted systems of entertainment I do, mountain biking is the most concrete and immediate. I recognize dirt, rocks, the swoop of the earth, from walking, my most natural activity. Skiing and boating, while overall better evocations of human flight, lack that razor connection with everyday experience which makes descending on a mountain bike so damn fun. I had a lot of fun on Saturday. I’ve also been exceedingly casual about my cycling since the GMAR, and it showed: I had one good long climb in me. By the second, headed up from Goose Lake on the Stateline Trail, I was pedaling squares when I wasn’t walking. It was 230pm, and only the known first third of the 30+ mile loop was ridden. Ed, Laurie and I turned around, while Aaron and Norm pushed on. We three enjoyed the fantastic descent down into Fish Creek, I crashed at slow speed on some mud and broke my rear brake level, Laurie crashed at slow speed on a switchback and went into the bushes (laughing the whole way), and Ed realized, after owning it for over a year, that the zipper on his jersey was sewn on backwards at the factory. We arrived back at the cars at six, split two beers, and bailed to Missoula for big burritos and sleep. Norm and Aaron pushed over the uncertainty and closed the loop in 12 hours. A very impressive effort. If I may be so bold, since I first started Thursday Night Riding with them years ago they’ve both matured massively as riders, opening the Pandora’s Box that is endurance mountain biking. Aaron’s talking about the AZT 300, and how hard it would be to train up here in snow land. This is a ride worth doing, and I’ve given more than enough hints for you to find it. Autumn is here. Compare to the same view last August. I like to think that my/our outdoor pursuits are of the noble, refined sort. Refined in a more literal sense, stripped of cultural connotations. It is easy to be a fan of, to be entertained by, the adrenaline of descending singletrack or ferrying to make the only line in a boulder garden. It takes a more refined, discerning, patient, mature, and I would say complete appreciation for how personal growth is driven by experience, and is in turn at the root of entertainment and fulfillment, to love and embrace the full human-powered experience. Frought as it is with blisters and the decidedly un-telegenic. This is why I find it difficult to be patient with the increasingly solipsistic direction of some adventure media, and the simpering which so often goes hand in hand (from folks who ought to know better). My packrafting and fishing Sunday provided plenty of moments which obliged me to dwell on the more refined virtues of adventure entertainment. I’ve only gotten holes in my seat twice, and I’ve only run the North Fork of the Blackfoot twice, and for some twist of fate they’ve come together both times. It is not a run where you could get by without a seat. Folding down the backrest and strapping my folded pack under it worked ok, but the extra slippage was not appreciated during the endless power ferries and snickersnacks. Or that time I got pinned, flipped, and swam. I stopped to fish the deepest pool on the run, to regain my humor after slipping backwards off my improvised seat and loosing my line for the upteenth time. Many casts and three different flies brought several rises but no takes over 20 minutes, until the uncared-for tail end of a drift with a #18 Stimulator brought a rock down on the end of my line. My Amago bent double, two hand were barely enough, and I had to rush forward into waist-deep water when it ran downstream. When I finally brought it upstream a ways and into view, I was stricken dumb at the salmonesque Rainbow at the other end of my 6X tippet, such that I almost let the line snap when the fish took another run upstream. Back into waist deep water, digging into the gravel to stay upright. The fish eventually, finally got tired, and I brought it slooowwly toward the gravel bar (I didn’t have a net). When I gently reached for the line (standard tenkara landing technique, not suited to 24″ fish) the fish gave one insolent toss of the head, snapped the tippet, and was gone. I’d let all fish go without handling them if I could do it without leaving hooks in mouths all over Montana, but I was pretty upset at the time to have not officially closed the argument with that fish. Very upset. But that, as they say, is fishing. And a fitting cap for a weekend of the most refined entertainment. Excellent write up, outstanding day! Minor point: 260″ circumference, or 83″ diameter. To be more forestry correct, we old foresters would say 80″ dbh (dbh standing for diameter at breast height). Glad we got together on an adventure – that sounds like one huge trout! No pics of the trout, so ya’ll will have to take my word that I wasn’t exaggerating. Which I wasn’t. You make your fish smaller, and I’ll switch of the lights of that bike I caught in the river. I believe there’s a strong difference between consumption of entertainment and the search for meaning. Church is hardly entertaining and yet millions of Americans devote countless hours to their religious rituals. And I bet they’d argue that the time they spend in church is much more purposeful and less absurd than going to see a movie. The same could be said of outdoor pursuits, and for many of us I think these activities as much a part of our quest to find meaning in our lives as they are an effective way to get a hit from the body’s pleasure chemicals. You touched on this idea later in this post, but even the rhetorical argument that time spent engaging the body outdoors is essentially pointless bothers me enough that I felt compelled to chime in. In the grand scheme of the universe, everything about life is pointless, unless we attach meaning to it. In believe outdoor activities and social engagement are an important part of this search for meaning, whereas most “entertainment,” such as going to the movies, is more about distraction and respite from this mentally and physically difficult pursuit. Exactly. My argument is that meaning and entertainment are like rectangles and squares. Entertainment is on some level at least concerned with meaning, whereas meaning is not necessarily concerned with being entertaining (aka fun). I do think that contemporary culture is increasingly trying to flatten the two into one (I hear churches are trying to be more entertaining these days, they don’t do mass in Latin anymore). I’d like to think that more refined forms of entertainment recognize that meaning or FUN can be a more complex, less immediately gratifying thing. And that adventure might be a part of that. Those two riders are walking up what appears to be a perfectly rideable section of singletrack. Looks gorgeous up there. I dig the #1 and #4 images, love the movement in the photographs. It’s STIL (steeper than it looks), as well as a 20″ wide, 2-3 foot deep horse rut. Rideable by someone going up, just not me. As one of the hike-a-bikers, I agree with Dave, not to mention being seven hours and 6,000 ft into it. 🙂 I’ve actually not seen such deep horse ruts (having not spent enough time in places like the Bob I guess) – reminded me of the deep Brown Bear ruts I used to come onto in SE Alaska.